Avda. 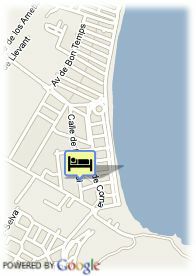 S´Estanyol, s/n, 07560 Cala Millor, Spanje. An elegant and luxurious five star hotel found only 150 metres away from the Cala Millor beach. Surrounded by an enormous garden area over 19.000 m2; the ideal environment for the demanding guest looking for tranquility and service quality during their holidays. This five star Hotel is located about 35 miles away from the Palma Airport.The area around the Hotel stands out for its tranquillity and from being a few metres from Punta de N´Amer; declared a nature reserve because of its unique wildlife. This Hotel offers 203 rooms; 111 suites, 2 senior suites and 90 double rooms totally climatized and equipped to the highest standards. Also offers an interior and exterior pool, Jacuzzi, 6 tennis courts (clay), a gymnasium, a sauna, a Turkish bath, three conference rooms, shops, a beauty farm, parking, a garage, room service, cafeteria, a bar, a buffet and "a la carte" restaurant, a reading and games room, a play-ground, mini-bar, table-tennis, billiards, satellite TV and safes in every room. Visa, Maestro, Mastercard, American Express.